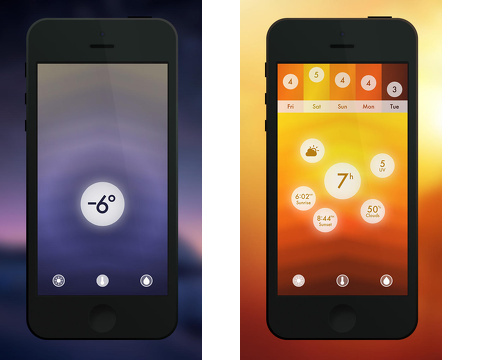 The Haze iPhone, iPod Touch, and iPad app gives you a slick snapshot of the weather. 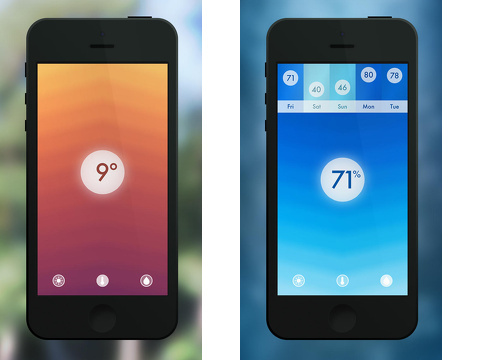 This design-driven weather iOS app is more than just attractive, but also it is innovative in its incorporation of gestures and tilt control to navigate the interface. The Haze iPhone app uses handwritten script against a chic colored background. These graphic elements provide a cool, zen vibe, as they fill your screen. You unlock backgrounds by opening and using the Haze iPhone app. This is an interesting way to use typical gaming incentives in a weather iOS app. I prefer the Candy background, as it uses red to blue colors typically associated with temperatures. The other color combinations are appealing, but they are less intuitive. The colors move and blend into one another when a day’s temperature trend changes. A downward movement of the colors indicates plunging temperatures, and the upward movement reflects increasing temperatures. On a day that is growing colder, the red moves through a spectrum of hot to light pink, and then becomes a light blue that intensifies to dark blue. The current temperature is contained in a circle on the screen. If the temperature is consistent, then the colors do not move. A tap on the current temperature results in five new bubbles with complementary information – high, low, windchill, wind direction, and wind speed. In the bottom of the screen, there are three icons that change the information on the screen. The center icon is the temperature icon. Each of these icons function like the temperature icon where a touch yields greater detail. In the lower left corner, there is a sun icon that gives you hours of sunlight, UV, sunrise, sunset, and cloud information. In the lower right corner of the screen, you can access precipitation information including the amount expected and humidity level. If tilt control is activated, you can tilt your iPhone between the precipitation, temperature, and sunlight information. This is a cool, unexpected feature. At the top of the screen, the week’s conditions are compared. You can tap or tilt to change the information between temperature, sunlight, and precipitation. The shade of the color for each day’s box reflects a higher, lower, or similar condition. For this week, my high temperatures are varying from 35 degrees to 14 degrees, so the 30 degree temperatures are pinkish purple with lower temperatures in light and dark blue. This $2.99 download from the iTunes App Store is a refreshing approach to changing temperatures and conditions, but it is not filled with the details needed to handle complex weather systems. However, for normal day to day use, the Haze iPhone app gathers loads of information into a stylish, engaging interface. AppSafari review of Haze was written by Jenni Ward on January 21st, 2014 and categorized under App Store, Productivity, Reference, Travel, Utilities, Weather. Page viewed 5025 times, 1 so far today. Need help on using these apps? Please read the Help Page. Haze is great. I like it. Go ahead with this lovely blog! Haze is a great app.